CRISP A IR C O M F O R TA B L E SLEEP! As with the anticipation of fall color and cooler temperatures announcing Autumn's arrival, we delight in presenting our designers' newest Fall collections for your bed, bath and table. Sometimes we need a change of color to start the season off right. Other times, an unexpected pattern or item to enliven the space. If you appreciate practical and oh-so-fine or oh-my-gosh-beautiful to spark renewed life into your bedroom, bath, or kitchen and dining area we hope perusing the following pages will give you pleasure. 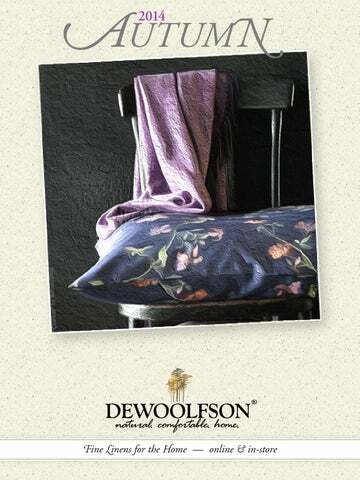 Each page is bursting with what's new and notable at dewoolfson. Don't forget, if you want to learn more about any of the linens you see, click on the image and you will be taken to that page on our merchant website www.dewoolfsonlinens.com. We hope you find ourAutumn look book to be inspiring and useful in your quest for living beautifully and harmoniously with your soul. Live, | & Laugh Beautifully. w w w.de wool f son .c om w w w.de wool f son .c om 80 0.554.3696 © 2 014 DE WO OL F S ON D OW N I N T ’ L ., I NC .